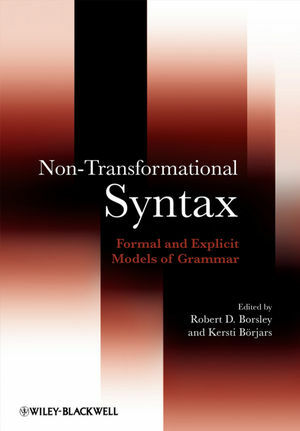 This authoritative introduction explores the four main non-transformational syntactic frameworks: Head-driven Phrase Structure Grammar, Lexical-Functional Grammar, Categorial Grammar, and Simpler Syntax. It also considers a range of issues that arise in connection with these approaches, including questions about processing and acquisition. Robert Borsley is Professor of Linguistics in University of Essex. He has published widely in the field of syntactic theory and has made important contributions to the Head-driven Phrase Structure Grammar framework. Kersti Börjars is Professor of Linguistics at the University of Manchester. She has published within the areas of morphology, historical linguistics, and morpho-syntactic theory, in particular Lexical-Functional Grammar. Introduction: Robert D. Borsley (University of Essex) and Kersti Börjars (University of Manchester). 1. Elementary principles of Head-driven Phrase Structure Grammar (Georgia M Green). 2. Advanced topics in Head-driven Phrase Structure Grammar Andreas (Kathol, Adam Przepiórkowski and Jesse Tseng). 3. Lexical-Functional Grammar: interactions between morphology and syntax (Rachel Nordlinger Joan Bresnan). 4. Lexical-Functional Grammar: functional structure (Helge Lødrup). 5. Combinatory Categorial Grammar (Mark Steedman and Jason Baldridge). 6. Multi-Modal Type-Logical Grammar (Richard T Oehrle). 7. Alternative minimalist visions of language (Ray Jackendoff). 8. Feature-based grammar (James P. Blevins). 9. Lexicalism, periphrasis and implicative morphology (Farrell Ackerman, Gregory T Stump and Gert Webelhuth). 10. Performance-compatible competence grammar (Ivan A Sag and Thomas Wasow). 11. Modelling grammar growth: universal grammar without innate principles or parameters (Georgia M. Green). 12. Language Acquisition with feature-based grammars (Aline Villavicencio).